A chaise longue (literally: long chair) is a gorgeous, comfortable and underrated piece of furniture. You use it to lie down all by yourself, but it also functions as a stylish two-seater sofa. Because the backrest does not span the entire length, it will look less solid in comparison with a real sofa. Her at vidaXL, we have an amazing selection these fantastic chairs in a variety of fabulous materials. 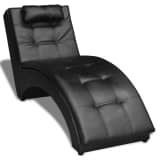 Instead of an armchair or recliner, you could also choose to get an indoor chaise longue. This fantastic piece of furniture is incredibly comfortable and creates even more seating space. Your guests will love the new local point to your room and you will have trouble getting up from this comfortable sofa! The materials we have used for our chaise longues, really do contribute the comfort of these chairs. 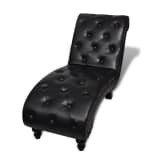 For example, choose a chaise longue made of high-quality faux leather or a combination of cotton and polyester. These materials are very easy to clean. If you want to hit two birds with one stone, you could consider a corner sofa. What you can end up with, is not only a sofa, but also a chaise longue. 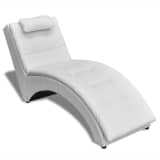 With some models, the chaise longue is detachable so you can put it somewhere else. Here at vidaXL, you will find several corner sofas with a chaise longue attached. These are comfortable to sit on, but also fantastic to lie down on.